There is one game that is taking over mobile device owners lives at the moment, and this is none other than 4 Pics 1 Word where players get four pictures and have to guess the answer with one word. Today we can happily let you all know that the new 4 Pics 1 Word game has add an update that is now at version 2.1. Many players of this addictive app have sat there for a while playing away only but to get to the end with no more puzzles to complete, and those been sitting there patiently waiting for a new update have no need to wait any longer because the new update adds many more puzzles for you to answer and enjoy. Developers LOTUM GmbH have updated its new app with heaps more puzzles and also mentions that a lot more are underway, players can now install this update direct from their mobile devices or if you do not have the game yet you can install via the App Store (iTunes) or Google Play. Please do let us know if you are already playing 4 Pics 1 Word on your iOS or Android device right now, if you have installed the new update we would love for you to let us know what the pictures are and how many more puzzles have been added to the app. 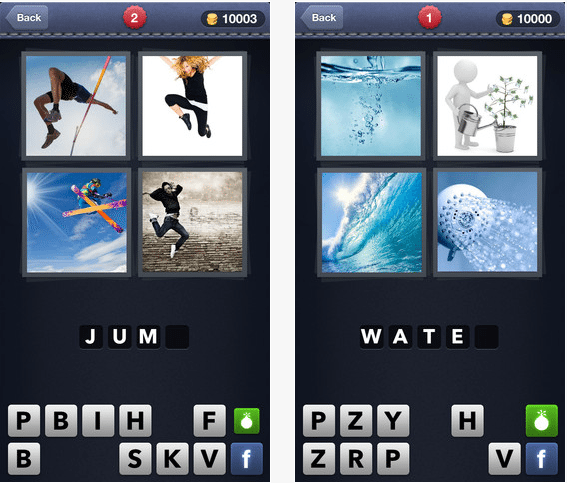 If you are playing and you are stuck you may want to read our previous article title “4 Pics 1 Word app answers to complete all levels” right here, have fun.